SpotIM Messenger Password Recovery is a tool that allows you to find and decrypt the passwords of most popular instant messaging clients. 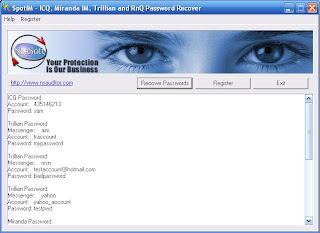 The program recovers lost or forgotten passwords for ICQ, Trillian, Miranda, &RQ instant messengers and Camfrog Video Chat, Easy Web Cam accounts. SpotIM instantly cracks and decrypts the passwords saved on your computer.